Fred Van Lente is back with "War Mother." After making a splash with the 4001 A.D one-shot last year, Van Lente along with artists Stephen Segovia and Elmer Santos is bringing a new miniseries to Valiant. After removing the previous cruel leader of the Grove, Ana the 'War Mother' now has the burden of governing one of the desolate regions of this 41st century dystopian future. Unfortunately, resources are scarce and it forces her to venture out again in hopes of finding another sustainable area to live. Armed with only her wits and a sentient A.I. weapon that she calls Flaco, Ana leaves behind a whiny husband and anxious citizens to follow a beacon coming from a remote high-rise. The one-shot established Ana as a relentless warrior willing to do whatever is necessary for her people. This opening chapter finds her more comfortable in her role as leader, almost complacent, which makes her seem flippant in regards to the problems facing the Grove. And when she's in the field facing down scavengers she's a little too jovial and nonchalant about the situation at hand. I don't remember this level of hubris from the one-shot. She's a badass and she knows it but it comes off as arrogance. Ana is still a cool character whose bravery and skill is unmatched but her personality has changed a bit since her one-shot. This abandoned high-rise where the beacon originated from seems like the perfect new home but perhaps it's too good to be true. The beacon also attracted less friendly individuals as well which makes keeping it protected a challenge. Van Lente is setting up the migration to a new home with some mysterious dangers hidden and it works well despite some familiar story notes we've seen before. Ana is still the leader you want to follow but her early portrayal in the issue was a little off-putting. Stephen Segovia, Elmer Santos, and Andrew Dalhouse didn't work on the one-shot but they knock this issue out of the park. There are so much detail and visceral action that get rich colors and fluid layouts. There's a great sense of urban decay with nature working its way back to reclaim the area with growing weeds and moss covering some of the high-rise and surrounding areas. This is a dystopia but hasn't reached Mad Max -level just yet. There's still a chance for humanity given the chance and it's beautifully captured by the art team. 'War Mother' is a franchise in the making. The one-shot set the table for this mini and it Van Lente and company delivers a familiar but exciting dystopian survival story. Ana the War Mother is a little cockier than before but still the leader you want to face the danger of new home in a new land. 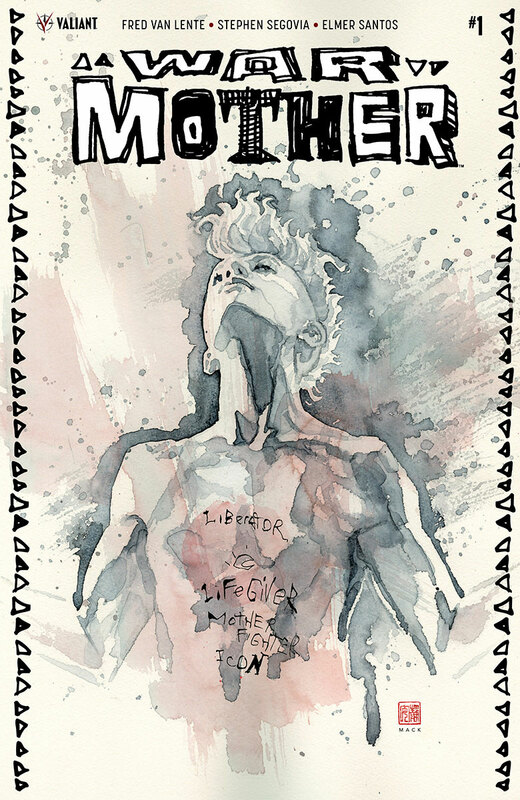 'War Mother' is worth the read.